The Arsenic Act (14 & 15 Vict c 13) was an Act of Parliament passed by the United Kingdom Parliament in 1851, during the reign of Queen Victoria. 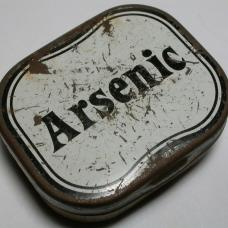 Arsenic was at the time widely used as a pigment and in agricultural products such as sheep dressings; the Act was introduced to address increasing public concern over accidental and deliberate arsenic poisonings. The definition of arsenic for the purposes of the Act included "Arsenious Acid and the Arsenites, Arsenic Acid and the Arseniates, and all other colourless poisonous Preparations of Arsenic". The Act required those selling such products to maintain a written and signed record of those to whom they had sold arsenic, including the quantity and its stated purpose. It also required that unless the arsenic was to be used for a purpose that would make such treatment unsuitable, for example in medical or agricultural applications, it had to be coloured with either soot or indigo. The maximum penalty for breaching the terms of the Act, or providing false information, was £20, equivalent to about £12,000 as of 2010. The Act did not restrict who was allowed to sell arsenic, as there was at the time no legal definition of a pharmacist. The Arsenic Act was repealed by the Pharmacy and Poisons Act 1933. With poisoning becoming a popular means of murder, this act was passed to prevent the unintentional consumption of arsenic by requiring producers to color their arsenic.